Last Wednesday, the European Space Agency (ESA) released the results of measurements conducted by the Rosetta space probe, currently in orbit of a 2.5-mile wide comet designated as 67P/Churyumov-Gerasimenko. The measurements are the newest development in the quest to determine the origins of Earth's water - specifically, whether it was delivered by impacts from comets or asteroids. The findings revealed that the chemical composition of the water on the comet 67P was significantly different than that found in Earth's oceans. "Wait, what? Isn't water H2O, no matter where you find it?" If you find yourself wondering how comet water could be different from Earth water, or if you're interested in how chemistry can be applied in space, read on. Atoms are composed of three basic subatomic particles: positively-charged protons, negatively-charged electrons, and neutrons, which have no charge. Atoms of different elements always have different numbers of protons, and atoms of the same element always have the same number of protons. Electrons are much messier, but they don't play much of a role in this story, so we'll leave them for another day. different stuff on the subatomic level. Neutrons add to the mass of an atom without changing its chemical identity. Atoms of the same element can have different numbers of neutrons. The simplest (and most relevant) example is the difference between hydrogen (H) and deuterium (D). The average hydrogen atom contains only a proton and an electron. Deuterium, on the other hand, has a proton, an electron, and a neutron, so it is heavier than a regular hydrogen atom, but because it still has only one proton, it still acts like hydrogen. Hydrogen and deuterium are called isotopes of one another - same element, different mass. You may have heard the word "isotope" connected with radioactivity, such as the famous plutonium-239 used in nuclear bombs, or carbon-14 used for radiocarbon dating. Radioactive isotopes are unstable and decompose at predictable rates. However, there are plenty of stable, non-radioactive isotopes that do not decompose on their own. 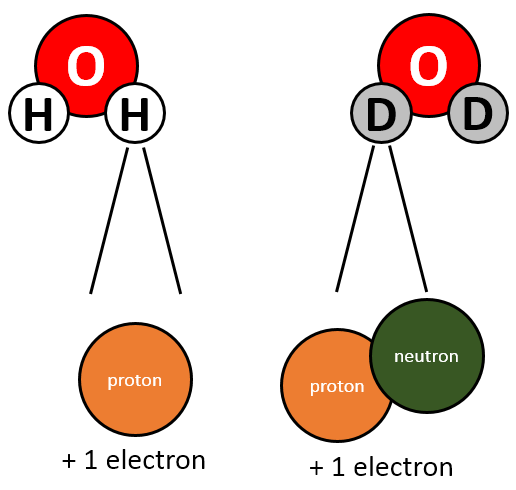 Hydrogen and deuterium are two examples. A very important consequence of their stability: once a sample containing hydrogen and deuterium is isolated from its environment, the ratio of hydrogen to deuterium will never change. Stable isotopes have (almost) the same chemistry as one another. Hydrogen can react with oxygen to form water, and so can deuterium. H2O, D2O, and HDO all exist, and all are colorless, odorless, tasteless liquids at room temperature. On Earth, about 16 of every 1,000 hydrogen atoms are actually deuterium. So, if these three kinds of water are so similar to each other, how do scientists figure out the difference? One very common method for determining the amount of an isotope present in a sample is to measure the mass of a molecule of that sample using a technique called mass spectrometry, often abbreviated MS. In mass spectrometry, molecules are hit by a high-energy spark of electricity to charge them up. Then, the molecular ions (charged molecules) are flown through a tube in the presence of an electric or magnetic field. The field is adjusted to allow only ions of a certain mass-to-charge ratio to pass through to the detector, which measures how many of the ions got through. Different mass-to-charge ratios are permitted through the tube one-at-a-time as the instrument continually adjusts the field strength. In this way, an analyst can measure the relative amounts of chemicals of different masses within the original sample. 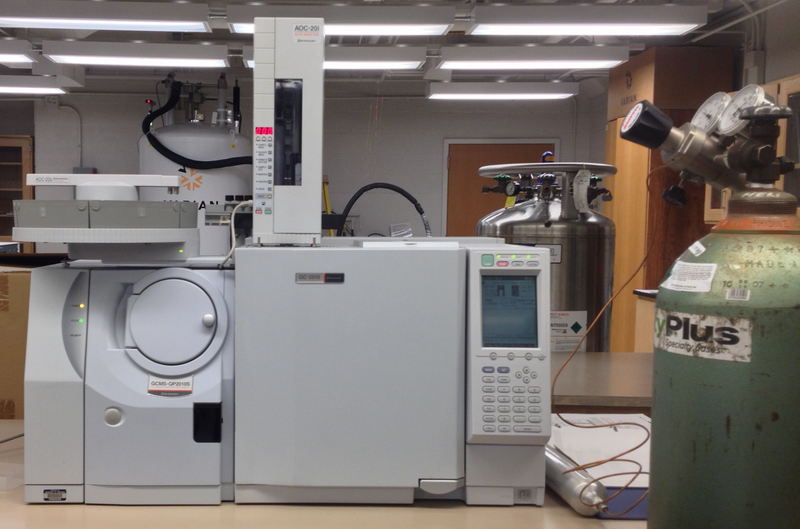 Mass spectrometry can be coupled with other separation or chemical analysis techniques to give even more information about the sample. The ESA's Rosetta probe contains two very sophisticated mass spectrometers. Since there is no easy way to bring the water on the comet to Earth for analysis, the ESA brought the mass spectrometer to the comet. The readings that were sent back to Earth showed that the water on comet 67P contains three times more deuterium than the average value in Earth's oceans. Since deuterium is stable, and since the comet is an isolated system that does not exchange water with other bodies in the solar system, the findings suggest that water from comet 67P and related comets was not the primary source for Earth's water. Of course not! Science is never over! The Rosetta measurement is just one piece of an extremely large and complicated puzzle. It is strong, but not conclusive, evidence that Earth's oceans could not have come from cometary collisions. For starters, Rosetta has only measured the composition of the comet's outer layer, so the deeper water could potentially be different. Secondly, 67P is only one comet among many. According to Dr. Nicholas Dauphas at the University of Chicago, quoted by Dan Vergano at National Geographic, this "is a very exciting study that raises more questions than it answers." One intriguing facet of the Rosetta measurement, though, is its simplicity. Even though the ESA spent millions on launching the probe to comet 67P in an unprecedented feat of aeronautics, the chemistry that the probe examined in these measurements is fairly basic. The next time you're sitting in General Chemistry picturing a chemist toiling behind a benchtop somewhere in a sterile lab, maybe try picturing that scene in space. Everything is cooler in space.